As you’ll see below, fresh juice is a big part of Common’s diet. He rarely goes a day without it. So it makes sense that he hooked up with Naked Juice to take part in the brand’s #DrinkGoodDoGood campaign (along with folks like Tom Colicchio), which focuses on bringing awareness to areas that lack access to affordable fruits and vegetables. 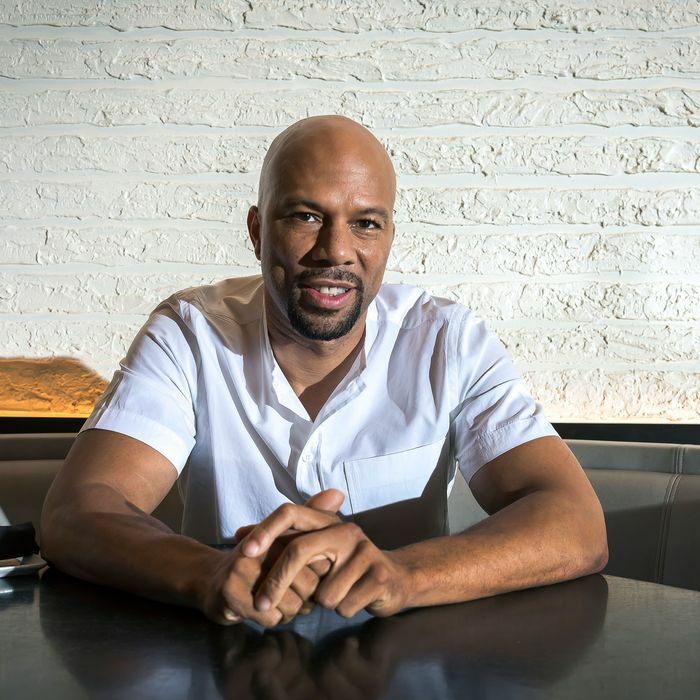 Even still, juice is just one part of Common’s healthy approach to eating, something he says started because of a few classic hip-hop lyrics. Check it out in this week’s Grub Street Diet. Juice is my coffee. This morning I have a workout session in Los Angeles with my trainer, Q, who I’ve been with since 2014. But first I load up on some fruit, vegetables, and a green juice with cucumber, pear, spinach, rose water, lemon, schizandra berries, and chlorophyll. Then I do a turmeric, lemon, and ginger vitality shot. After my workout, I have an açai bowl made with unsweetened açai, freshly sprouted almond milk, banana, blueberries, coconut butter, and Beaming protein. Then a berry smoothie. Lunch is a smoked-salmon salad and raw avocado tartlet with an organic salad by my chef, Lauren Von Der Pool. Lauren’s my main source of food. I never learned how to cook; it was always my mother saying, “I’m gonna cook for you,” or me being lazy and not doing it. Sometimes I’m embarrassed that I can’t cook, but I’m grateful that I can find ways to eat well. Lauren travels with me sometimes when I’m on set. For dinner, she makes Dover sole in maitake broth topped with basil micro greens. I have that with water. I’m in Chicago today for some work. I start off with another açai bowl, then a Naked Juice Green Machine — my favorite, and I’m not just saying that. My mother gave me a call the other day because she heard an interview I gave where I said, “I want you to be clearer about saying healthier foods can help stop the violence.” I knew when I made that statement people were going to be like, “What are you talking about, Common?” What I was referring to was less sugar. With kids, when they don’t have as much sugar, it doesn’t give them that boost of energy that is not healthy. This is helping me to think better and be better as a person. Later, I do a berry smoothie and shrimp salad on toast, by Lauren. It’s amazing. Dinner is at RPM Italian. I get the branzino. RPM has one of my favorite branzino dishes in the Chicago area — grilled with oregano and capers. Sunday morning starts with a peppermint tea and a breakfast of smoked salmon with eggs over medium on gluten-free toast. My Sunday routine is simple: I go to church, and if I’m in Los Angeles, I ride to Malibu; I go to the movies, have dinner with friends, and sometimes I’ll go into the studio. For lunch, I start with a beet juice to pair with a roasted-beet-and-jicama salad with baby arugula, goat cheese, and a honey-lemon vinaigrette at the Pearl Tavern, this seafood spot on the Loop in Chicago. I have that with a seared arctic char with an heirloom-tomato salad, cucumber, and basil pesto. Dinner is branzino again, with charred broccoli, Aleppo chile, garlic scape, and fennel from MK. I also have some roasted carrots with French beans, pistachios, and za’atar. I like it hearty while still tasting clean, and MK’s seasoning is phenomenal. Back in Los Angeles, and my training session with Q starts at 10 a.m. Before that I have an açai bowl and a berry smoothie. I actually credit hip-hop somewhat for my eating habits. One song specifically was called “My Philosophy” by KRS-One and Boogie Down Productions, BDP. In the song he says: “A vegetarian, no goat or ham or chicken or turkey or hamburger / ‘Cause to me that’s suicide, self-murder.” I would rap these songs, and I would say them with pride. I hadn’t gotten to the mind-state of what KRS was saying, but it meant something to me, to a certain degree. Then Brand Nubian would talk about not eating pork. Because a lot of hip-hop at that time was Islamic-influenced culturally, it was conscious music, and at the same token it was repping the Five-Percent Nation, that was also based in Islam. I wasn’t exposed to the actual people in Chicago that chose that type of diet, so hip-hop was the eye-opener. The implementation kind of came organically, and gradually became a lifestyle. For lunch I do shrimp tacos à la Lauren. Dinner is one of my go-to fishes: snapper, with green beans and sweet potatoes. Workout at 10 a.m., so I start my day with a hefty açai bowl, a powerful vitality shot made with ginger and turmeric, and finish it off with a berry smoothie I pick up along the way. Lauren makes a grilled salmon paired with a mixed green salad. These days I’m talking with visual artists and directors about my new music project called Black America Again. It’s a music project, it’s sociopolitical, it’s love, it’s God music, it’s speaking to now. Giving people a good perspective of what Black America is. Not just the protests, the love, the joy, the being in love. And for the project I don’t want to do videos, I want to do short films, visual art pieces because I’m really inspired by art. So lately I’ve just been working, getting those things together. I’ve also been going back and forth with the director Ava DuVernay about doing the music for her documentary The 13th. For dinner I have branzino with corn. As you can probably tell from this point, branzino is my absolute favorite. I can have it again and again — and I do.